Preheat the oven to 180 ºC. Place Turducken in a large roasting tray and cover with 2 layers of foil. Roast at 180 ºC for 3 ½ hours. Take out of the oven and remove the foil. Rest for 10 minutes. Increase the oven temperature to 200 ºC. 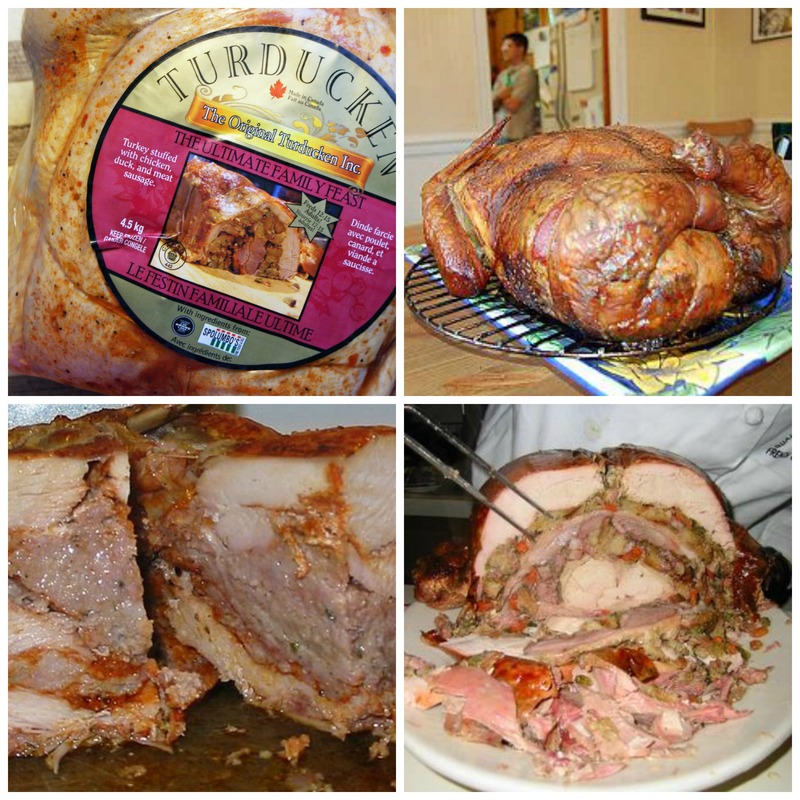 Remove the Turducken net – use a pair of scissors to help you. Brush all over with the marmalade to make a sticky surface. Slice plums and figs and paste the slices onto the bird. Use toothpicks to spear fruit and keep them in place. Drizzle over some syrup and put back into the 200 ºC oven for 30 minutes. Check the roast every 5 minutes to make sure it’s not burning. Drizzle with syrup every 10 minutes to produce a glossy finish. Remove from the oven, take out the toothpicks and carve. Serve on a platter decorated with fig leaves, fresh figs and plum halves. Pass berry sauce around in a gravy boat. Place about 2 stacks of charcoal along the sides of the Weber and position a drip tray above this. Once the charcoal has reached the right heat, wrap your Turducken in foil, place on the drip tray and close the Weber’s lid. Be sure to leave the air vents open to create suction and check on your Turducken regularly so it does not overcook. After 2-3 hours of cooking time, test the Turducken by poking it with a thin skewer. If the juices run clear then you know that it’s ready. Unwrap your Turducken from the foil and generously glaze it with the marmalade to make a sticky surface. Slice plums and figs and paste the slices onto the bird. Use toothpicks to spear fruit and keep them in place. Drizzle over some syrup and put back into the Weber for about 30 minutes, drizzle with syrup every 10 minutes to produce a glassy finish. Remove from the Weber and let it rest for a few minutes before carving. Serve on a platter decorated with fig leaves, fresh figs and plum halves. Drain the syrup from the ginger and reserve. Put stem ginger and berries in a food processor and whizz to purée. Tip into a pot over a medium heat and add the port and reserved ginger syrup. Simmer for 20 minutes, stirring occasionally, until thick and glossy. Sieve if you want a smooth gravy. Season to taste and serve with the roast. To defrost, you can simply thaw your Turducken in the refrigerator for 5 days or for rapid thawing place in sink or bucket with running cool water for 24 – 36 hours. Cooking time: Internal temperature is the best indicator. As long as it takes for the internal temperature to exceed 165°F is how long it takes for your turducken to cook. Please allow approx. 60 – 75 mins per kilogram. e.g. a 5 kg Turducken may take up to 7 hrs. Note: there’s no need to baste or cover with foil, although many of our customers do prefer to have their turducken covered in foil for the first 2 – 4 hours of cooking. If bird is not elevated on a rack, accumulated drippings may have to be removed from the pan every few hours so that the lower portion does not deep fry in the hot oil. Set slow cooker to ‘high’. Place your turducken inside and close the lid. After 1.5 -2hrs change setting to ‘low’ and cook until internal temperature exceeds 165°F. Heat oven to 350°F. Place the bird on a rack and put it in an oven pan, or if you don’t have a rack – cut up a couple of carrots, onions and celery, put in an oven pan, place your Turducken on top of the veggies, add some white wine and water in and set it in the centre of the oven and bake until internal temperature exceeds 165°F. Cooking time: Internal temperature is the best indicator. As long as it takes for the internal temperature to exceed 165°F is how long it takes for your turducken to cook. Please allow approx. 30 – 45 mins per kilogram. e.g. a 5 kg Turducken would take up to 4 hrs. Please calculate approx. 0.3 – 0.4 kg per person. To defrost, you can simply thaw your Turducken Premium Roast in the refrigerator for 3 – 4 days or for rapid thawing place in sink or bucket with running cool water for 24 – 30 hours. Heat oven to 220°F. Many prefer to cover or wrap roast in foil, but this is not necessary. Place the roast on a rack and put it in an oven pan and set it in the centre of the oven and bake until internal temperature exceeds 165°F. Cooking time: Internal temperature is the best indicator. As long as it takes for the internal temperature to exceed 165°F is how long it takes for your turducken to cook. Approx 5 – 6.5 hrs. e.g. a 3 kg / 6.5 lb Roast may take up to 6.5 hrs. Note: there’s no need to baste, or cover with foil although many of our customers do prefer to have their roast covered in foil for the first 2 – 4 hours of cooking. If roast is not elevated on a rack, accumulated drippings may have to be removed from the pan every few hours so that the lower portion does not deep fry in the hot oil. Set slow cooker to ‘high’. Place your roast inside and close the lid. After 1.5 -2hrs change setting to ‘low’ and cook until internal temperature exceeds 165°F. Cooking time: Internal temperature is the best indicator. As long as it takes for the internal temperature to exceed 165°F is how long it takes for your roast to cook. e.g. a 3 kg / 6.5 lb Roast may take up to 6.5 hrs. Ensure propane tank is full. Light grill. For best results keep one burner switched to OFF. (Ex, one a two burner BBQ keep one side off; on a three burner BBQ keep the middle burner off.) Bring temperature inside grill up to a constant 220°F. Place foil wrapped roast directly above the burner that has been switched off so it is not over direct flame. Close lid and cook until internal temperature exceeds 165°F. Heat oven to 350°F. Place the roast on a rack and put it in an oven pan, or if you don’t have a rack – cut up a couple of carrots, onions and celery, put in an oven pan, place your roast on top of the veggies, add some white wine and water in and set it in the centre of the oven and bake until internal temperature exceeds 165°F. Cooking time: Internal temperature is the best indicator. As long as it takes for the internal temperature to exceed 165°F is how long it takes for your roast to cook. e.g. a 3 kg / 6.5 lb Roast may take up to 4 hrs. Note: Using a high temperature we recommend checking the internal temperature often as well as basting the roast during its roasting time every ½ hour to keep it nice and moist. Use its own drippings mixed with water and white wine. Your Turducken Premium Roast is fragile when hot. This roast has no bone structure to hold it shape. Be sure to keep it on or in it’s cooking container. Remove the roast carefully from the oven/grill/slow cooker cover immediately in foil and allow it to rest for at least 30 min before moving or serving. Meanwhile, you may want to make some gravy with some of the drippings. With strong spatulas inserted underneath (remember there are no bones to support the roast’s structure), carefully transfer the roast to a serving platter or cutting board. Remove the netting by making a cut with scissors down the middle and then carefully peel back. You may wish to present it to your guests before/while carving. Be sure to make your slices crosswise so that each slice contains all three meats.